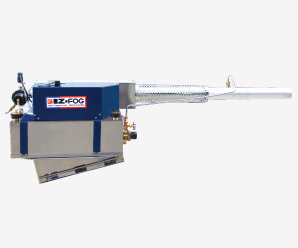 ﻿ Mounted on Motorcycle-iz-300-Fogging Equipment,fumigator,pest control,fogging machine-IZ-FOG Co.Ltd. This product can easily be mounted on a general motorbike. when mobility and accessibility of motorbikes is utilized for fumigation, most dead zones including city centers and suburban farm areas where road are too strait or access is limited can also be fumigated. This Product can serve two purposes; as a smoke machine and also as a fog machine depending on the requirements. The nozzle is designed to swivel to the right at 50° and to the left at 50° without having to move the motorbike, you can aim the nozzle at the desired position to spray the reagent. Fitted with the solenoid value, the reagent can easily be sprayed using the toggle switch. also fitted with the limit switch the spray is automatically shut off when there is abnormal operation with the machine and prevent a make fine. The driver on the driving possible control the chemical spray ON, OFF switch taked at the motor cycle handlebar.